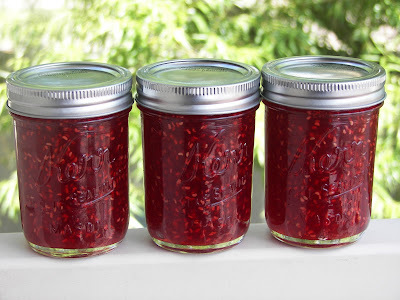 I did some honest work today; I made some jam -- two batches of raspberry jam. There IS something so fulfilling about making jam. I like the process -- the smell and color of the fruit while it is cooking. 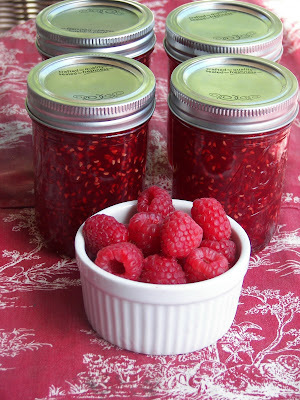 I love how beautiful the jam looks in the jars. I also LOVE the color red. Look at these jars -- they KNOW they look good. My kids are wild about raspberry jam -- it's one of their weaknesses. I WILL have to hide some for a rainy day -- it is like candy for them. Who wouldn't be wild about jam when it comes from such a luscious fruit -- I even have a teenie bit of guilt eating raspberries because they are soooooo good. I am sure I helped my mom prepare the fruit for jam when I was a young girl, but I didn't make jam by myself until I was in my 30's. I was living on acreage in California and we had wild blackberries on our property. A friend from church, Terry Swarbrick, came home and taught me how. 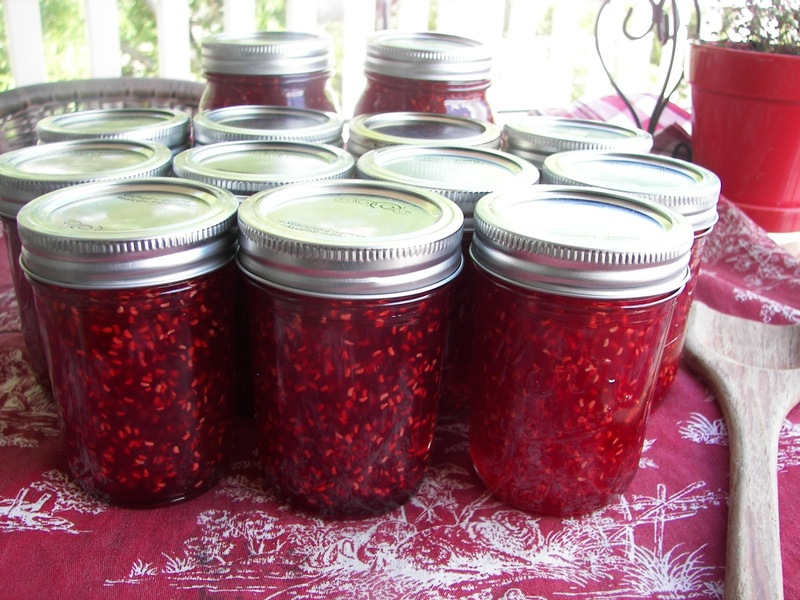 That blackberry jam -- even with all its seeds tasted so wonderful to me and I was hooked on making jam. Ten cups of fruit and an obscene amount of sugar yielded me 11 half-pints and 2 pints. There is no recipe today -- I just used the recipe on the pectin jar. I just wanted to show off my jars. Oh my word! That looks delicious! I really should make my own jam one of these days. A friend of mine brought over homemade strawberry jam one day and it was the best I had ever tasted. Looks like heaven. They are so pretty. You are right, it does look pretty in those jars. Great job! I need to do some canning. Expecially before Christmas! Yum! I haven't had a good rasberry jam in so long! Sounds so good, Joni and your jars are gorgeous. This does look so good! Glad I don't know your hiding spot! They are simply gorgeous! I love canning! I love making jam, I made strawberry and peach this summer. Yours looks beautiful. This looks so delicious! I love raspberries. Great shots. This looks delicious!! The raspberries were plentiful this year at the grocery. I should make this! YUM! 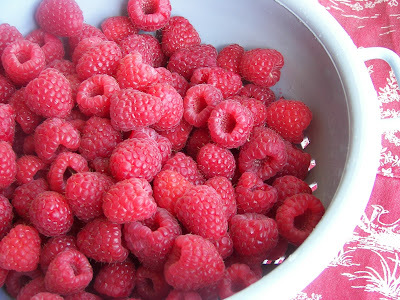 If I had a big bowl of red raspberries, I'd feel like the richest person in the world! I dearly love raspberry tea. Without a doubt I could eat a whole jar of this jam. Nothing better than a hot biscuits, smothered in butter and homemade jam. Raspberry jam is delicious and really pretty. I would love to have some on a nice warm biscuit or roll about now. Joni, This brings back memories for me. As a teen in 4-H, I entered cooking contests. I made freezer jam, among other things. I never did learn how to can, but I'm good at freezing! And homemade is SO much better than store-bought. Oh, just looking at this post is making me drool! You are right, there is nothing more beautiful than seeing freshly canned goodies all lined up! I trust that you've already put a few jars in the mail to me? ;) I haven't made jam in years, myself! Good job!